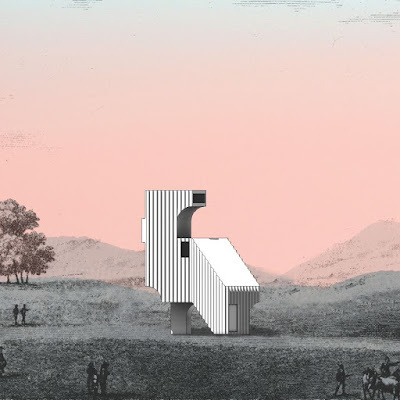 The thesis-project “The Descendants of Ancestors” takes it’s starting point in the paper projects of the architect Claude-Nicolas Ledoux, active in the late 18th century. Ledoux is known as one of the originators of “Architecture Parlant”. Driven by the idea of physiognomy of buildings, that the buildings form and character should fully represent its function, Ledoux created a idealistic architecture of strong geometrical shape and figure. The investigation takes a closer look at a number of houses of Ledoux. In a series of exploratory drawings and models this thesis searches for a intuitive and personal way of using precedency in architecture. How can I, personally, understand and make use of architectural history? The thesis tries to find a way of using the eccentric and figurative qualities found in the engravings of Ledoux by engaging them in a contemporary discussion about shape and character. By drawing on the chunkiness and the unsettling seductiveness of being out of scale found in Ledoux’s buildings the project attempts to turn them in to characters with an agency, a will of their own. Welcome to the opening vernissage on the 24th of September at 18.00. The exhibition is running from 24/9 to 1/1. Aron Fidjeland graduated KTH / Royal Institute of Technology in Spring 2015.